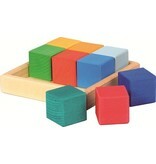 Gluckskafer cubes building set includes 9 pieces in a wood frame. Measures 14.5cm x 14.5cm x 5cm. Gluckskafer products are stained with water-based colours which bring out the grain of the wood. The wood surfaces feels slightly rough making the blocks less slippery. 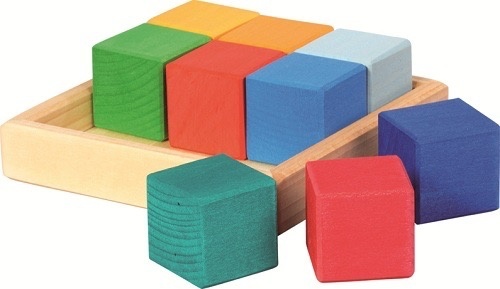 This is pleasing to the touch for children and makes for ease of building with blocks.